Traditional foods form an important part of the rich cultural heritage that can be found in Malaysia. 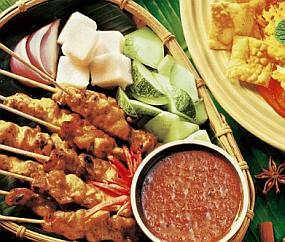 Foods of various origins, have blended together to form what is recognized as Malaysian food. The migration of people from one country to another has resulted in the dispersal of traditional foods from their country of origin. With time, many of these foods have been assimilated into the cuisines of the countries they settled in. However, it is interesting to note and compare the changes and modifications that have evolved in the methods of processing in the different countries. Malaysia has a rich variety of traditional foods processed from agricultural products as well as from animal and marine sources. The majority of these products are still being produced using traditional methods on a cottage industry scale. Traditional Malaysian foods are made from plant products as well as from those of animal or marine origin. There is a wide range of both fermented as well as non fermented products. In the context of this paper, agro-based products will be limited to only those of plant origin. Traditional products from glutinous rice include tapai pulut and tuak, while those from rice include meehoon, laksa, kuay teow, rag[ angkak, karas, dodo/, emping, apam, idli and tosai. On the other hand, products from both glutinous and non-glutinous rice include ketupat and lemang. Tapaipulut is a popular food in Malaysia and is commonly consumed as a desert. It is sweet yet slightly alcoholic with a fragrant, pleasant aroma. After fermentation, the rice becomes soft and juicy, and there will be some liquid produced. It is a perishable product as the fermentation continues even after the optimum stage of fermentation has been reached, resulting in a sour, alcoholic product. Mee hoon and laksa are another two products from rice. They are both vermicelli products and are basically similar except for size of the strands. The quality of these two products is very much dependent on the quality of the starch in the rice powder used. In the traditional method of production, broken rice is ground and mixed with starch. Tempoyak is produced by fermenting durians. This has a very strong characteristic odour and flavour which tends to limit its popularity. There is a wide variety of traditional products in Malaysia. However most of these are still being produced on a small industry or cottage industry scale.